An oasis in the heart of Flushing lavished with boutique-style home comfort and enhanced by coastal character charm, ‘Kenrose Cottage’ offers an idyllic holiday setting for groups of 6. Dating back to the 1800’s, many lovely original features have been retained in the pet-friendly property including sash windows and charming whitewashed walls. The timeless features are also complemented by all the must-have mod cons, for a truly unique year round stay. From first stepping onto the Cornish slate flooring of the hallway, guests will feel right at home within the restful contemporary interior of the property. Offering the perfect venue for indoor relaxation, the carpeted front living room is ideal for keeping families and friends amused. A sumptuous leather sofa and tub chairs feature alongside the welcome ambience of a contemporary wood burning stove. The nautical-style influences add a tranquil ambience to the room, whilst a flat screen Sky TV, DVD player, and WiFi access provide all the comfort of home. Leading on from the living room, the Cornish slate flooring of the hallway continues into a spacious dining room and separate fully-fitted kitchen. Whitewashed walls and coastal art provides a charming and inviting ambience with a solid oak table and stylish high backed leather seats to accommodate groups of 6. The equally stylish kitchen provides a lovely setting in which to prepare tasty home cooked meals. Fitted with classic white cabinets, a butler sink and solid wood work tops and fully-equipped with all the must-have appliances, for a care-free stay. A sliding door from the kitchen leads to a utility area, conveniently fitted with a washer dryer and a modern cloakroom WC. The chic and contemporary coastal flavour of the ground floor continues in the three beautiful bedrooms of the first floor. A pretty master bedroom at the front of the property has been finished in classic style, for a restful spot in which guests can savour a morning lie-in, to the sumptuous king size bed. The solid pine furniture and nautical touches paint a fitting coastal scene, which is further reflected in the equally-stylish second bedroom. Furnished with a comfortable double bed and overlooking the secluded rear garden, the second bedroom offers a peaceful haven in which an additional couple can easily unwind in, after a day by the sea. A nautical twist can also be enjoyed to the Laura Ashley style third bedroom, just perfect for smaller guests, with a set of high quality bunk beds. A baby cot and high chair are also on hand to accommodate young families staying in the property. The contemporary family bathroom offers a luxurious setting in which to revive and replenish the senses during your stay. Fitted with under-floor heating, a deep bath tub and a separate shower, the modern oasis of the bathroom is further enhanced by soft fluffy towels, for guest’s maximum comfort. To the rear of the property, guests can easily languish in the exotic splendour of a chic sheltered garden. Offering a tropical oasis of calm and serenity, the lush jungle foliage and palm trees provide a unique setting in which to entertain. An alfresco dining area features to the decked terrace whilst a raised sun deck provides the perfect sun trap in which to relax. All parking in Flushing is on-street and free of charge, and guests will usually be able to find a space just outside the house or close by without difficulty. In addition The Green House has a reserved parking space approximately 225 yards from the property should it be required. From ‘Kenrose Cottage,’ guests are just a stone’s throw away from the delights of Flushing village. Providing a sedate coastal charm in the heart of West Cornwall, Flushing provides an idyllic family friendly setting. Perfectly complementing a self-catering stay with a local village shop, two pubs and a bistro restaurant, Flushing is a great base for year-round stays. Children can keep amused at the pirate-themed play area whilst the dog-friendly beach at Kiln Quay and the coastal walk to Mylor offers the perfect excuse to enjoy some fresh sea air. A frequent passenger ferry from the quayside also offers the opportunity for a timeless spot of sightseeing, with a service to the harbour town of Falmouth and with connecting boats to the gardens of Trelissick, pretty St Mawes and the vibrant cathedral city of Truro. The luxury bathroom has been completely refitted with power shower, deep bath, recessed lighting, heated slate floor and illuminated mirror with shaver point. Visited in a wet and windy December and loved every minute! My daughter described the house as a cross between a boutique hotel and home from home, and she was spot on! Very stylish, very cosy, very clean and certainly lived up the high hopes that we had prior to arrival. Well equipped kitchen, cosy lounge with very effective wood burner, and very comfortable beds. The bathroom was beautiful, I could hardly drag myself out of the huge shower every morning! Flushing is a lovely village, the locals are extremely friendly and the two pubs both served extremely good food. There is also a restaurant on the waterfront where the ferry goes to Falmouth from but we ran out of time to try it. Thank you for sharing your lovely holiday home with us. We did not want to go home and will definitely be back. We've just returned from four magical days in Flushing. Not only was the weather really kind to us but our stay was made all the more perfect because the Green House was exceptional. So often the description of a holiday home fails to live up expectations and with a dog one's choice is very restricted. The Green House is clean, stylish and very well thought out. It's a cross between a bistro hotel and home, small touches like fresh flowers and milk along with local biscuits make you feel that house-letting is a passion, not just an occupation. We have just returned from a weeks holiday in the gorgeous village of flushing. The Green House is so beautiful, it is exactly as described, decorated to a very high standard - we were very comfortable. The weather was amazing and we enjoyed walking to the small beach at flushing every morning with our dog Teddy. Everyone in flushing is so friendly (very dog friendly too), we felt right at home. There are two fab pubs and a great local shop. We walked to Mylor Harbour, where we had breakfast. There is so much to do - we loved catching the ferry to falmouth which was buzzing, great restaurants and independant shops to mooch around. Stuart who owns The Green House was very helpful and we just wanted to say that we shall be back, and in fact we have already booked a return trip. Thank you! Wir verbrachten 2 Ferienwochen im August in diesem liebevoll eingerichteten Ferienhäuschen. Die Einrichtung ist sehr komfortabel und dennoch gemütlich. Küche und Bäder sehr gut ausgestattet (eine Kaffeemaschine fehlte allerdings) und alles in Allem sehr sauber und ordentlich. Nach einer Woche wurden nochmal Handtücher und Geschirrtücher gebracht! Besonders erwähnenswert ist die romantische Terrasse, die, sollte das Wetter dementsprechend sein, einem das Gefühl von mediterranem Ambiente vermittelt. Ein Fernseher mit sämtlichen Programmen (aber keine deutschen), ein DVD-Player und eine Playstation waren hilfreich bei schlechtem Wetter. Wir können das kleine Häuschen auf jeden Fall empfehlen! We had a lovely week the cottage as you said we would. The Green House was excellent. Well set out and decorated to a very high standard. We only wish we could have stayed another week. We found the people of Flushing very welcoming and friendly. Everyone stopped to chat asking what we had been upto. Dave at the Seven Stars kept our drinks topped up as Bob led a topical debate on politics and Jack at The Standard kept us amused during the Yatch Club quiz. We enjoyed the walk from Flushing to Mylor Harbour and then onto Mylor Bridge & back. and enjoyed an evening on the pontoon at the Pandora Inn. We also visited Marazion & St Micheals Mount, The Lost Gardens of Heligan, St Ives, Perrinporth and walked the coastal path form Pendenis Castle to Maenporth and back. The weather was kind to us and all in all we had a lovely weeks holiday. Stuart you have a lovely home in a lovely village and we thank you for sharing it with us for the week. We will be back next year! We stayed with two teenage children. 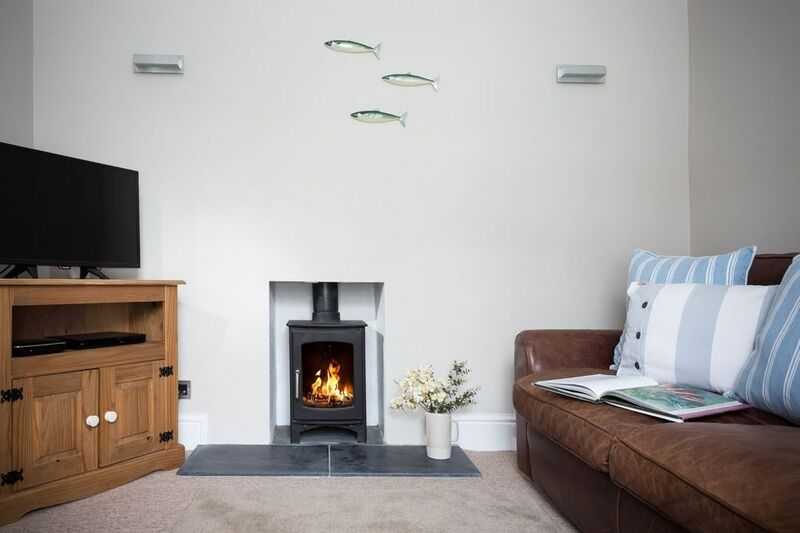 Flushing is an unspoiled beautiful fishing village, with easy access to visitors attractions-and particularly good for walks along the coast from the house.. The house is exactly as described and is a credit to Stuart. I found the Wi-Fi connection particularly useful in helping us plan our visits. I would particularly recommend Seabourne fish for seafood supplies (on left just before T junction into Penryn), and if you like Mussels or Crab then the Wheelhouse in Falmouth is outstanding for simply cooked, but fresh off the boat seafood, and good value-check it out on Trip Advisor.